Julie Mahn talks with some of her students. When it comes to the town of Hartsville, South Carolina, what you see depends on whom you ask. For Julie Mahn, Hartsville is not just her hometown; it’s the best place to live in America. It’s where she met her husband – in middle school. It’s where the entire community came together in prayer to pull her teenage son back from death’s door. And it’s where she now serves as the white principal of the school with the highest concentration of black children living in poverty. The daughter of sharecroppers and the first person in her family to ever go to college, Julie knows what those children are struggling to overcome. In a lot of ways, she’s still struggling to overcome them herself. 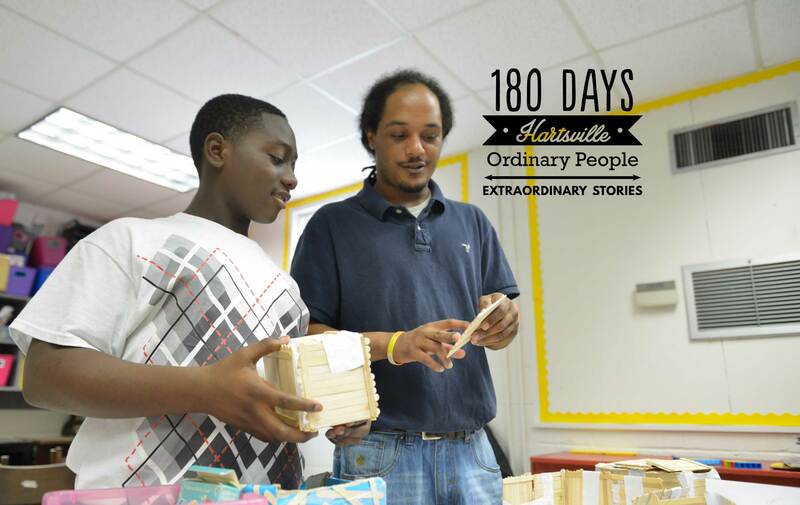 For Pierre Brown, Hartsville is a new adventure. Recently relocated from his childhood home in Timmonsville, SC, Pierre developed a passion for education as a young boy, in part to fill a void in his life for a male role model and the kind of teacher he never had. And just a few short years into his teaching career, Pierre is beginning to understand the magnitude of his role in the lives of his students, many of whom he hopes to encourage enough to be – like Julie – the first in their families to graduate college or even high school. For Harris Deloach, Hartsville is, historically, a place he’s struggled to “sell” to prospective new talent. Yes, there’s the side of town with the private college, the elegant mansions that line Home Avenue, and the reputation as “the little town with the big heart.” But there’s also the other side – the one with the crime rate three times the state average, the rising levels of unemployment, and the reputation as “Killerville.” To recruit top talent, Deloach knows one thing will matter more than anything else: the ability to offer a world-class public school system that can instill in each child the skills that are required for lifelong success – and he’s decided to spend $5 million of his company’s money to make it happen. Tara King understands what it will take to engineer such a massive shift: finding a way to overcome the weight of local history – which began back in 1817 when Captain Thomas Hart bought 500 acres of virgin pine forest, purchased hundreds of enslaved Africans, and made a fortune growing cotton and raising cattle – and bringing about a systemic culture shift in how the people of Hartsville see themselves, each other, and the world. Tara – a graduate of Hartsville’s first desegregated high school class in 1997 – is beginning her first year as a principal. And, as the new head of Hartsville’s most underperforming elementary school, she is giving everything she’s got to upgrade the spotty learning environments that young people have been exposed to at her school. Monay Parran personifies the significance of what’s at stake. As a child, Monay’s own life path veered irretrievably off course when she dropped out of high school and never completed the coursework to receive her GED. A single mother to three children, Monay must now work two minimum-wage jobs in two different cities. Most nights, she doesn’t get home until 11pm. And although she knows her children’s education is the key to their own chances of forging a different path, she is limited in her ability to keep them on the straight and narrow. Indeed, her oldest son, Rashon, has begun to spend increasing amounts of time with the wrong group of older boys in the neighborhood. A bright boy with decent grades, Rashon’s behavior has begun to concern his teachers, to the point that Monay is wondering if, despite all her efforts, the son is destined to follow the same path as the mother. As Ingram walks and listens, however, he wonders how his schools will fulfill the vision Deloach is describing. On one level, they have all the elements of success in place: $5 million of funding from Sonoco to fuel their efforts; a district that already boasts some of the highest-achieving schools in the state; and a coalition of all the town’s key partners pledging to do whatever they can to help. On another level, though, Ingram knows that American public education is in the midst of its biggest tectonic shifts in a generation. He knows that the higher-level thinking skills young people need to navigate the 21st century global economy don’t align well with a policy climate that measures schools solely by basic-skills standardized test scores. And he knows that even the best interventions at the school-level are often powerless to impact the economic prospects of a community’s poorest families. A thirty-year veteran of public education, Dr. Ingram is surprised by the inconsistencies of his new home. Hartsville has high rates of poverty – and it has a graduate rate of 92%. Hartsville has (thanks to the desegregation) richly diverse schools, yet its residents still lead, in most other aspects, segregated lives. And Hartsville has a zip code that places it squarely in the center of what has become known as the “corridor of shame,” yet its schools intend to become a national model for excellence. 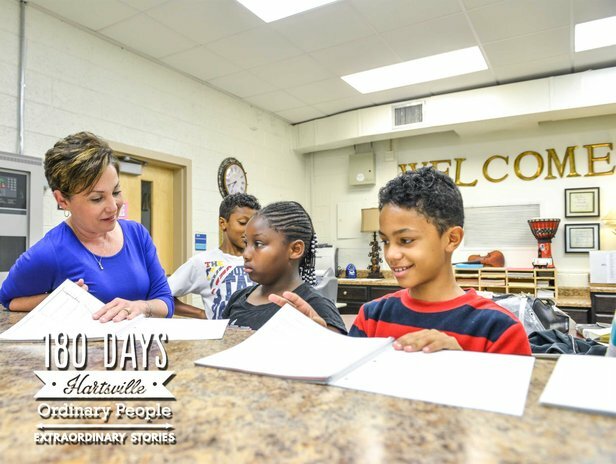 In 180 Days: Hartsville, viewers will experience a year in the life of one Southern town’s efforts to address the urgent demand for reform in American public schools, and watch what happens when the systems that can either fuel or diffuse that reform – bureaucracy, economic opportunity, and fixed mindsets – interact and intersect. Is Hartsville an anomaly, or do its successes point towards some transferrable and sustainable solutions? Can a community really change the fortunes of a generation by doubling down on their neighborhood schools? Or does the stark reality of the 21st century global economy outweigh the impact of one rural town’s efforts to prepare its children to compete in that economy?